If you follow me on Instagram or Twitter, you might know that Sunday was my 10-year wedding anniversary! Wow! It's crazy that it's already been 10 years. Since we are trying to save money to buy a house, we didn't want to get too extravagant for this milestone anniversary. Jeff did surprise me with a couple small gifts. Apparently the gift for 10 years is either tin or aluminum (depending on who you ask), so he got me this fun pencil set. I've been missing NYC lately and kind of wishing we were still living there, so this pencil set was super thoughtful! He also got me this little Space Case. 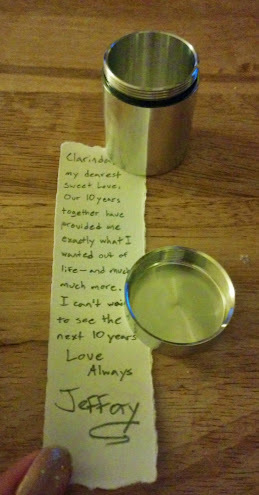 And wrote this sweet note on a little scroll. I'm not sure what I'll use the case for yet, but I love it! We got all dolled up and went to Envy Steakhouse. We live about 1 1/2 blocks from this restaurant, and it always smells so good when I run past it, so we thought we'd give it a try! Jeff made the reservation for 8pm, and even though I started getting ready around 1:30pm, we were a little late. All my primping took a little longer than anticipated. Or maybe it was all the YouTube tutorials I watched for tips on my nails and makeup. lol. My apologies for the creepy photo-bombing dog. Since we were running late, we didn't really have a chance to take many pictures, but I was in love with my outfit and makeup and nails. It took awhile, but everything really came together and I felt like a million bucks. When Jeff made the reservation, he mentioned we were celebrating our anniversary, and WOW! Everyone at Envy really made it extra special. I think that everyone stopped by to wish us a Happy Anniversary and thanked us for celebrating with them. We started off with a glass of Chianti (for me) and some whisky (for Jeff). We were feeling adventurous and thought it would be fun to try something new. The Chianti was good, but nothing spectacular. Of course, I'm only starting to enjoy red wine. Jeff still isn't a huge fan of whisky. I couldn't even bring myself to try it. The smell was too strong for me. Then came out the bread. It was delicious! I think there was 4 different varieties of dinner rolls. I ate two and Jeff at two. We ordered the Heirloom Tomato Caprese starter. Such a great choice! For our entree, we split the Tomahawk. It's a 40-oz ribeye steak served with grilled asparagus. We also ordered a side of garlic mashed potatoes. We spent the entire meal recounting all the fun adventures we've had in the past 10 years. Vacations to Chicago, NYC, San Francisco, USVI St Thomas, Costa Rica. Living in Minneapolis, Brooklyn, Oregon, back to Minneapolis/St Paul. How we ended up in Las Vegas more than two years ago. Lots of random stories; many that I'd totally forgotten about. 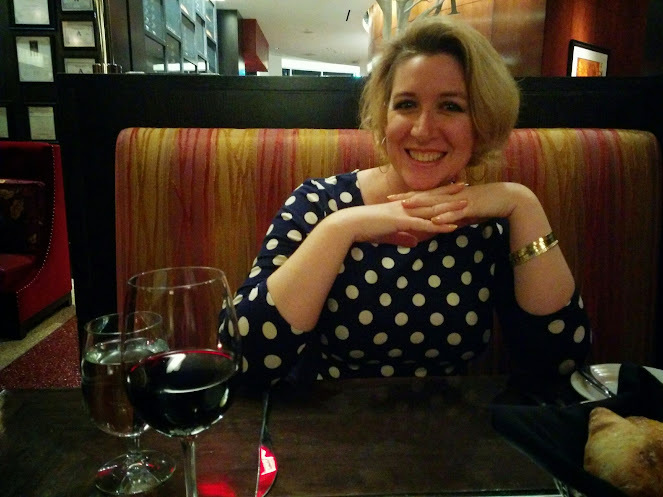 The food and the conversation were perfect way to celebrate our anniversary. And then they brought out dessert and a card from the manager - including a card for a complimentary glass of wine on our next visit. It was an incredible night! Definitely a great way to celebrate and honor 10 wonderful years of happiness. If you're ever in Vegas and celebrating a special occasion, I would definitely recommend Envy Steakhouse! Happy Anniversary! I looks like you all had a great time and I love that Sallie totally photo-bombed your pic! Thanks, Sarah. It was a fun night! And, I can always count on Sallie for a photobomb. Girl you look totally hot!! Your shoes!! I love watching you tube tutorials to find new ways to 'fix up'. Sounds like you had an awesome anniversary! Thanks so much, Katie! :-) Those shoes are pretty awesome, aren't they?